Whereas most college football teams started the weekend last Saturday, my alma mater is so bad they couldn't find anyone to play in week one. How can you not find somebody willing to play you on week one? So KU will instead open the season this Saturday, hosting that well-known Division....(hmm, don't know what level at which they play) uh, Division..... (googling, oh please don't be a D-III school) uh.... FCS opponent (phew!) South Dakota. Clearly, both teams are terrible. Both teams are hoping their head coaches still have the magic they once had. Kansas football, obviously, does not have the rabid fan base that KU basketball does. For instance, a couple weeks ago I got a “personal” letter from the head coach letting me know that season tickets were still available.... for $99 dollars. For the whole year. I have a ticket to next week's Oregon vs Tennessee game, the non-markup actual price for that ticket is $98 dollars. For comparison. So it stands to reason that if you are not an alum of either of these schools, then you probably do not have a great interest in this game. But consider the following! Kansas is on an 11 game losing streak. They beat South Dakota State (different school, people) in week one last year.... and haven't tasted victory since. South Dakota's recent history is nearly as awesome. They just hung on to beat UC Davis in the opener last week 10-7, so they are one-and-oh. Better than Kansas. However, last year, the Coyotes won in week two (they beat Colgate.... you might say they brushed them off! Thank you, try the veal, and don't forget to tip your waitress).... and didn't win again until last week. This will the schools first meeting.... since 1900. It's been 113 years since these two played football (against each other, not competitively... although for KU fans it feels like it). Now that's pretty cool. Kansas played AT South Dakota that game, in Vermillion, SD (no, I couldn't find it on a map either) and won 42-0. It would be almost cooler if the game were at South Dakota this time around, because the Coyotes play in... the DakotaDome. Best name possible for an indoor athletic venue in South Dakota (narrowly beating out the Corn Palace in Mitchell, which I have been to). If you're looking for upset potential from the Coyotes, South Dakota did beat Nebraska... in 1899. Their record against current and former Big 12 schools, including that win, is 1-27-2. South Dakota's head man has had more success at the collegiate level, albeit at smaller schools like South Dakota. Joe Glenn had 14 straight winning seasons at the FCS level, 11 at Northern Colorado (two national titles) and 3 at Montana (one national title). Then he also left for a prestigious Division-One school. Er, not really. He went to Wyoming, which, like Notre Dame, is a place where successful head coaches go to fail miserably. Nevertheless, he did get the Cowboys to the Vegas Bowl, where they beat UCLA in 2004. Oddly enough, this win did not occur against a UCLA team that had just fired its coach. Instead, it was the second year of the Karl Dorrell era, which is probably the same thing. Anyway, Glenn got canned after 2008, and was a TV analyst before taking the South Dakota job as they moved up to the FCS division last year. He is a South Dakota graduate (undergrad and masters, and also played football there), so this makes sense. 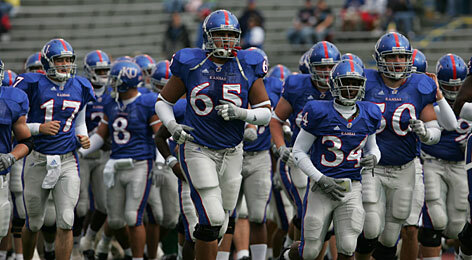 As a KU alum, I am hoping for something (read: anything) that will give me hope for the Charlie Weis era. Once again, Weis is hoping a transfer QB will do.... something. Last year it was a Notre Dame retread that Weis had coached, this year it's one-time highly touted and respected Jake Heaps, formerly of BYU. (seriously the video is pretty entertaining) The KU offense does have a good running back in James Sims, who had over a thousand yards rushing last year and 9 TD's for a team that only won a single game. However, if they can't move the ball against the Yotes.... blech. The Yotes offense features a “rush-heavy attack.” This may in fact be code for “we can't throw the ball,” or it could be code for “student body left.” I am going with option A, considering that QB Josh Vander Maten was 9 of 17 for 91 yards against UC Davis, and one guy (Terrance Terry, an automatic nominee for the 2013 Name That Sounds Fake All-Star Team) caught four of those passes for 48 yards. And they only put up 10 points. Against UC Davis. So if the KU defense can't contain this bunch.... yeccchhhhh. Last year, KU won their first game of the year. It figures to be the same this year. And if not... $99 for a season ticket will seem like even more of a rip-off.